Statuary historically was used to honor persons, animals, Gods, deities and other mythical creatures out of carved stone. Angels, Mother Mary and Buddha are among the most popular of garden statuary. 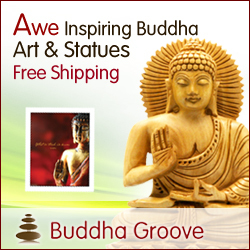 The embodiment of what the statue symbolizes is the purpose for its reverence and use in the garden. Thus, an angel may represent protection or that of a guardian, whereas a Kwan Yin represents compassion. Sculpture can take many forms including life sized human forms, abstract shapes in a myriad of materials including bronze, stone, steel, glass or anything that can be fabricated into the desired form. Sculpture is typically the work of artists who make original pieces and can be expensive compared to mass produced cast stone representations that are more created as statuary rather than as sculpture. Kinetic sculpture is popular today as a trend and provides movement caused by wind. Garden art is subset of statuary and sculpture and includes an eclectic assortment of decorative objects including whimsical gnomes and the like. St. Francis of Assisi shown here is probably the most popular saint in the Catholic church. Known as the patron saint of animals and the environment it seems to be a good fit for most gardens. Thus using statuary that represents something that you believe in is why most people choose any particular statuary. Statuary provides focal points as well as help to create a theme for the garden. Religious statuary can be used as an expression of one's belief system. Gazing balls or gazing globes are a type of garden decor and more informal compared to sculpture and statuary. Gazing globes are European and symbolize a crystal ball into which one may ponder or use it as a mystical tool. The use of smaller sized statues must be placed in proportion to the garden setting otherwise they will look out of scale.